Since one in four Americans suffer from insomnia, it seems like there’s a natural market for Sleepy Princess in the Demon Castle, a manga about a character so determined to get a good night’s sleep that she’d risk death or dismemberment for forty winks. Sleepy Princess plays the title character’s insomnia for laughs, however, turning the heroine’s quest for the perfect mattress into a light-hearted romp, rather than an expensive ordeal involving black-out curtains, melatonin, and meditation videos. 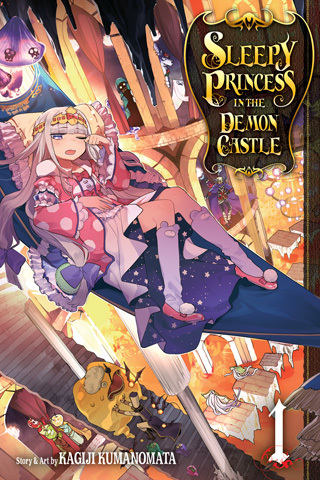 That the story is fun and breezy is nothing short of a miracle, though older readers may experience a twinge of jealously at Princess Syalis’ ability to fall asleep anywhere, anytime once she has the right gear. Author Kagiji Kumanomata handles the set-up with great economy: in just two pages, we learn the Demon King has kidnapped Syalis in a bid to conquer the human world. Though the Demon King stashes Syalis in a dungeon populated by fearsome beasts, Syalis quickly sizes up the situation and makes it work to her advantage. “Since I’m hostage, the Demon King has no intention of harming me,” she notes. “I have no duties to take care of here… And the food’s pretty tasty!” The one drawback to her new digs? “I haven’t been able to get a good night’s rest since I was brought here!” she exclaims. As with other one-joke manga, Sleepy Princess occasionally strains for laughs; an episode involving poison mushrooms falls flat, as does a spoof of Princess Knight. The chapters’ brevity helps keep the story from bogging down in bad jokes, as does Kumanomata’s consummate attention to detail; there’s always something funny happening, even if the gags are buried in the background or lurking on the edges of the page. An artful adaptation by Annette Roman helps bridge the translation divide, as do Susan Daigle-Leach’s marvelous sound effects. (If you’ve ever wondered what a posse of demon teddy bears might sound like, she’s got you covered.) Best of all, Kumanomata has barely scratched the surface when it comes to insomnia, leaving the door open for future quests, from finding the right bedtime snack to finding the right temperature for sleeping. Recommended. Nice to see Viz is still putting out Shonen Sunday titles although at times it feels like after the first volume or two the titles kind of get forgotten with the exception of Case Closed, Inuyasha, Ranma 1/2, and maybe Kekkaishi. Magi: The Labyrinth of Magic, Itsuwaribito, Arata: The Legend (which I really liked), Maoh: Juvenile Remix (which got some critical praise for Shunji Inukai as a character) and Rin-ne all seemed to kind of suffer this fate of slow death by benign neglect. So nice to see that Shonen Sunday is still active as an imprint but I often get the feeling that it’s not a top priority over at Viz. I mean when this title dropped I thought “oh neat” and my second thought was “Viz still has Shonen Sunday imprint I’m surprised.” So while I’d like to see Karakuri Circus (link to plot summary: https://myanimelist.net/manga/868/Karakuri_Circus) get released in English I’d hate to see it just kind languish on the release schedule. I was surprised that VIZ didn’t license Arakawa’s Silver Spoon, which is currently being serialized in Shonen Sunday; you’d think that VIZ would want it, considering the fact VIZ is putting out a fancy new edition of Full Metal Alchemist right now. I always felt like that was leaving money on the table but then again considering the only other “agricultural” Manga of note that saw release in English was Moyasimon: Tales of Agriculture and how poorly that sold. I couldn’t blame Viz. Or it could just be it’s too off-brand for what Viz wants to do with the Shonen Sunday imprint despite being serialized in the same magazine. This setup reminds me a little of Delicious in Dungeon, except instead of creatively scrounging for edibles she’s looking for good bedding material. I wonder how Princess Syalis’s name is pronounced? The way I hear it in my head, it bears an unfortunate resemblance to the medication Cialis. Oh, me too! I’m glad to hear someone else was struggling with (and giggling at) the pronunciation of her name.